Well at least according to this link on the Motor Trend Forums, which came from somewhere else. Nissan has finalized the performance numbers on the GT-R Spec V.
Nissan's newest supercar will have a very limited production run. Unlike the stock GT-R, the Spec V will be a 2-seater, though both models will look virtually identical. Output of the GT-R's 3.8-liter twin-turbo V-6 has been increased to 520 bhp at 6500 rpm and 440 lb.-ft. of torque peaking from 3200–5200 rpm. The Spec V will be slimmer by about 200 lb., tipping the scales at 3615 lb. 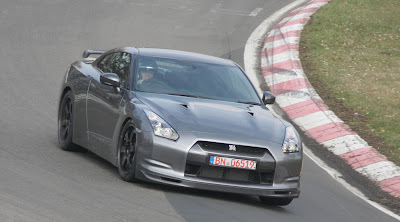 "We expect the GT-R Spec V to be introduced in the U.S. sometime in early 2009, with a price tag of about $130,000 "
they got it from my blog most likly... tho im getting no credit for it at all. ohh well.. keep up teh cool posts man!